Hector is trapped. The water truck, sealed to hide its human cargo, has broken down. The coyotes have taken all the passengers’ money for a mechanic and have not returned. Hector finds a name in his friend Cesar’s phone: Annimac. A name with an American number. He must reach her, both for rescue and to pass along the message Cesar has come so far to deliver. But are his messages going through? Over four days, as water and food run low, Hector tells how he came to this desperate place. His story takes us from Oaxaca — its rich culture, its rapid change — to the dangers of the border, exposing the tangled ties between Mexico and El Norte. And it reminds us of the power of storytelling and the power of hope, as Hector fights to ensure his message makes it out of the truck and into the world. 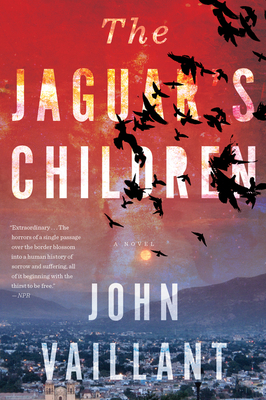 Both an outstanding suspense novel and an arresting window into the relationship between two great cultures, The Jaguar’s Children shows how deeply interconnected all of us, always, are. "I have long admired the visceral storytelling and moral complexity of John Vaillant’s brilliant non-fiction about humankind’s tragically ambivalent relationship with the natural world. Now he brings his abundant literary gifts to a debut novel set in a very real borderland in which human beings are themselves treated like animals. The Jaguar’s Children is a beautifully rendered lament for an imperiled culture and the brave lives that would preserve it. You should read it." "The Jaguar's Children is devastating. It's at once a literary mystery, an engrossing tour de force, and a brilliant commentary on humanity's role in the physical world. The voice that echoes out from that abandoned place Vaillant so masterfully creates won't leave me." "John Vaillant is in the business of writing masterpieces. But this first novel will make his many followers fall over in shock. Vaillant sees the tragedy of human predation on the border for what it is—a real-world horror worthy of Stephen King. This book rushes at you relentless as a nightmare and doesn't let up until it kicks out the walls. Settle in. You're going to need a stiff drink. Make it ice water." "John Vaillant's revelatory nonfiction is catalyzed by eloquent prose and exuberant curiosity. In his first novel, The Jaguar's Children, Vaillant proves that his heart and imagination are as expansive and fierce as his radiant intellect. With a desperate young immigrant as our companion, we enter the dangerous borderlands between countries and generations; myth and magic; human community and the vast, infinitely mysterious, wild environment. Perilously close to death, we navigate the hallucinatory map of the mind where those who endure still hope to discover one thin thread of light leading from terror to survival. Never have I encountered a writer with more energy or compassion."